The futuristic restaurant concept is the latest initiative in Chinese e-commerce giant Alibaba’s push to modernise service and retail in a country where robotics and artificial intelligence are increasingly being integrated into commerce. Raising efficiency and lowering labour costs are the objectives at Alibaba’s “Robot.He” diners, where waiters have been replaced by robots about the size of microwave ovens, which roll around the dining room on table-high runways. “In Shanghai, a waiter costs up to 10,000 yuan ($1,500) per month. That’s hundreds of thousands in cost every year. And two shifts of people are needed,” said Cao Haitao, the Alibaba product manager who developed the concept. 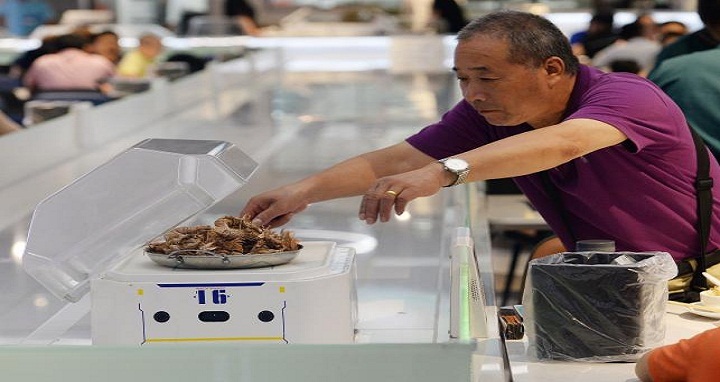 The diners are attached to Alibaba’s new Hema chain of semi-automated supermarkets, where grocery shoppers fill their “carts” on a mobile app and have the merchandise brought to them at checkout via conveyor tracks on the ceiling, or delivered straight to their homes. Industry experts say they serve more as showcases of Alibaba’s tech prowess than a serious business model in a country where labour costs are relatively low. Alibaba’s e-commerce rival JD.com has announced plans to open 1,000 restaurants by 2020 in which food will be prepared and served by robots. “Before, everyone was all going for rapid expansion. Now the growth is gone and everyone has to focus on improving their operations,” said Jason Ding, a China retail expert with Bain & Company. Chinese AI advocates predict robots will someday perform a range of mundane duties as living standards rise, from delivery to sweeping floors and providing companionship, particularly as China’s labour force has shrunk due to the recently relaxed one-child population control policy. But it’s a delicate issue for Chinese policy-makers due to the potential for human job losses, and the government is in the midst of a long-term push to develop the country’s services industry partly as a job creator, as manufacturing increasingly becomes mechanised.